Bryce Harper #34 of the Washington Nationals hits a piece of the cover off the ball during the sixth inning against the Miami Marlins inning at Nationals Park on July 06, 2018 in Washington, DC. The Home Run Derby will be televised on Monday night at 8 p.m. ET. 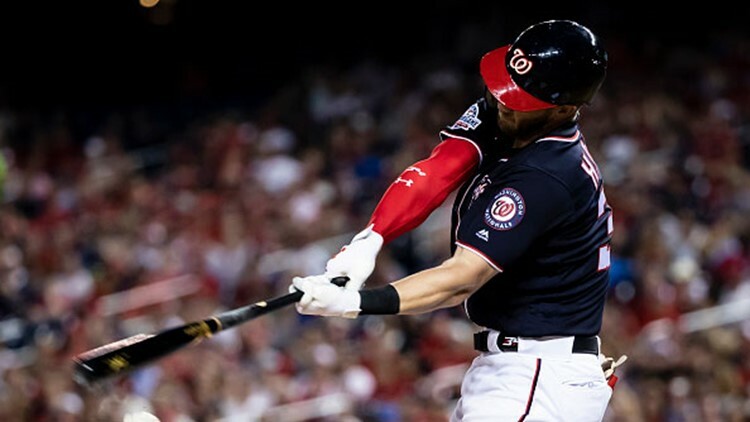 Washington Nationals outfielder and All-Star Game ambassador Bryce Harper will headline this year's Home Run Derby at Nationals Park in Washington. Joining him for Monday's showcase is a group of sluggers who have hit 150 home runs. Seven of the eight participants hail from teams in the National League, with Houston Astros third baseman Alex Bregman the lone American League representative. The field is seeded 1-8 based upon their regular-season home run total. The Home Run Derby will be televised on ESPN on Monday night at 8 p.m. ET.